Our Grand Canyon Skywalk tour is one of the most popular things to do while visiting Las Vegas. For those unfamiliar with the Skywalk, it’s the glass walkway (bridge) that lets you stand some 3,500 over the bottom of the Grand Canyon. As you can imagine, it’s a thrilling experience for young and old alike. Grand Canyon West Rim offers beautiful vistas that range from stunning canyon views, to pristine woodlands, and even lush canyon basins that are rich in wildlife. One of the most famous tourist spots in the world, this Grand Canyon West Rim Tour includes the unique Grand Canyon Skywalk. This glass bridge is its showpiece. The views from the Grand Canyon Skywalk are sensational. Directly in front will be spectacular Eagle Point, a canyon wall that looks like an eagle. This formation is also of high cultural importance to the native Hualapai Tribe. Next, turn your attention north and you’ll get an excellent view of the Canyon and the Colorado River, the waterway that over hundreds of millions of years eroded the banks of the Colorado Plateau to create the National Park. Adjacent to the Skywalk is the Indian Cultural Center. It’s an excellent place to learn about the Hualapai, the tribe that owns the 1-million-acre reservation upon which the Skywalk is located. Then there’s the free shuttle to Guano Point, the Rim’s most famous lookout and the one that takes you even closer to the Canyon’s gorge! The West Rim is the outermost part of the Grand Canyon and is only 120 miles east of Las Vegas. The drive by luxury motor coach is 2 hours and includes a photo stop on the Arizona side of Hoover Dam. After which you will then travel over the Mike O’Callaghan–Pat Tillman Memorial Hoover Dam Bypass Bridge. Total tour time is approximately 10 hours and we’ll have you back in Las Vegas around 6:30 p.m. (other tour companies get you back at 8 p.m.!). Free morning snack-breakfast (pastries, coffee, juice, tea and water). Free Hoover Dam photo stop. 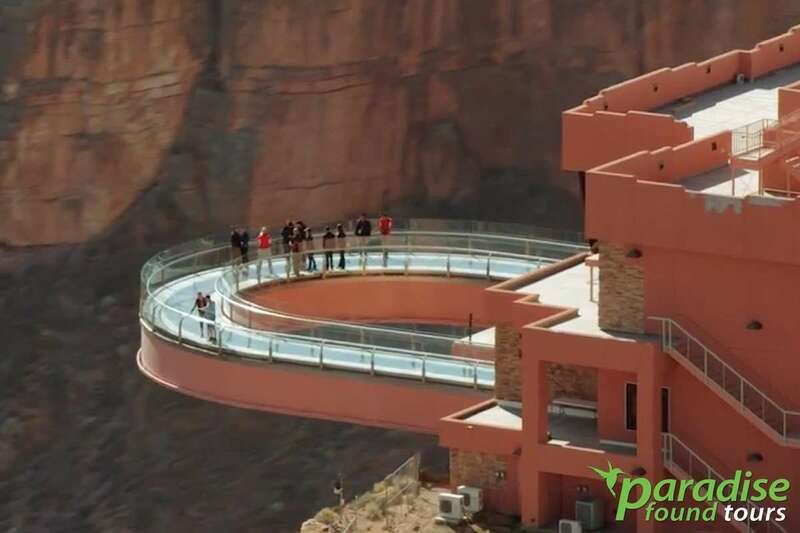 Grand Canyon Skywalk tour admission is included within the price. Lunch is included. It’s a box lunch and you can choose from turkey, ham or beef. Vegetarian is available upon request. Gluten-free and kosher are not available but you are free to bring such foods with you. Please let us know what your choice is on our reservation form under “special requests.” You are welcome to bring your own food if none of the above is appropriate. Deluxe luxury 56-passenger motorcoach w/ excellent amenities and climate control. We never use mini-buses. Hotel Pickup: Our Grand Canyon Skywalk tour includes free pick up and return at your Las Vegas hotel. No pick-ups are available in the Summerlin/Henderson areas. The Hualapai Indian Tribe does not allow pictures to be taken on the Skywalk tour. The Hualapai Indian Tribe provides professional photographers. Cost is not included in the package. Lockers are also available free of charge for your personal belongings.